Search Madison Wisconsin » Moving to Madison? 10 Reasons Why You Should! Moving to Madison? 10 Reasons Why You Should! Moving to Madison? Here’s a complete guide to Madison, WI! Why the heck should anyone be moving to Madison? Thinking about moving to Madison? Make sure you read this article first, you’ll want to know what you’re in for! Is moving to Madison really for you? I’ll try to keep my pro-Madison Bias in check and just stick to the facts. Also be sure to check out the affordability of Madison Homes For Sale. You’ll see that though Madison has the same amenities that bigger cities do, housing is still very affordable. Moving to Madison? Well, contrary to popular belief we do get along here in Madison. Despite the national coverage of the protests and rallies we do like each other…usually 🙂 The fact that we have had our differences is part of what makes Madison such a great place to live. You can come and experience such a range of culture here from business, to the university, to the energized political climate, there is rarely a dull moment. In addition to the variety of experiences as a benefit of moving to Madison there are many others I want to cover as you think about joining us here in Badger Country. These are the reasons I came up with. However, I can only imagine how I’ll be able to add to this list as time goes on as living in Madison just keeps getting better and better. 1) Madison has Amazing Views! One of the most amazing sights in Madison is to take in a sunset overlooking one of the lakes in Madison. One of my favorite places to take in a sunset on the lake is at the Memorial Union on the UW Madison Campus. Here’s one example above of the amazing colors and reflections off the water with the boats on a gorgeous night overlooking Lake Mendota. Another amazing view is as you are driving to downtown Madison from the south on John Nolan Dr. As you hit the opening when you pass Olin Park you can take in our city’s amazing skyline featuring the gorgeous Monona Terrace shown below designed by famous architect Frank Lloyd Wright. Another great sight to take in is the gorgeous countryside just west of Madison. Home to much of the Wisconsin Ironman bike course, there is varying terrain including bluffs, farms, hills, wide open fields, and dense woods which makes for a gorgeous afternoon drive or ride. Don’t forget if you drive by a farm in early spring when the farmers are spreading that natural fertilizer on the fields, take in a deep breath of that Wisconsin fresh air. That is a good enough reason to move to Madison right there. You can also take in some sights at some of our great state parks that are in and around Madison. One of the favorites is a short drive up Hwy 12 through the bluffs to Devil’s Lake State Park. If your moving to Madison or even just visiting you’ll want to spend some time at our state parks. A few of the other nearby state parks are Governor Nelson, Blue Mounds, Capital Springs, and Lake Kegonsa. Moving to Madison means you’ll become part of one of the top college sports towns in the country. So what makes UW Madison the best college sports town? Not only are the sports teams always amongst the best in the country, the student life here has a lot to offer. Need a break from your studies? Take a stroll down state street or decompress with one of the many things to do around the capitol square. If that’s a bit too much and you need a more peaceful setting, feel free to lay out a blanket at one of the parks around the lake and take in the fresh air. If you need to get outside for some final exam stress relief you have 20 miles of trails, the 1,260 acre UW Madison Arboretum,or miles and miles of bike trails. Livability also has ranked Madison as one of the top Music Cities so there’s always a spot to take in some live music. 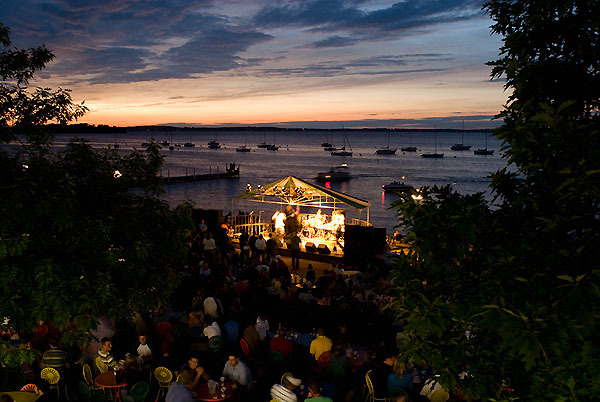 Don’t miss live music at one of the Madison favorites, the Memorial Union right on Lake Mendota. The academics are also world class at UW Madison. In addition to their renown undergraduate programs, these graduate programs have ranked among the best in the country: School of Education, Robert M. La Follette School of Public Affairs, College of Engineering, School of Business, School of Medicine and Public Health and Law Schools. UW Madison has always had a high standard for acceptance which is a driver for their continued success as a sought after university. So if you’re thinking about moving to Madison, make sure you take a stroll through the UW Campus and you’ll understand why its been rated among the best for college towns across the country. If you love good food, moving to Madison is the right move for you! With a population under 250,000, Madison is often overlooked as one of the nation’s most outstanding “foodie” towns. Due to its close proximity to local farms, Madison was ahead of the game when it came to the “farm to table” movement. Many of the menus feature lists of local vendors showing each restaurant’s commitment to sourcing only quality, home grown ingredients. Take Graze for example pictured below. A popular destination for Madison locals, as well as out-of-towners, Graze boasts a bold menu focusing on farm-raised comfort foods. Chef Tory Miller has been recognized by a number of different national publications for his creativity and for his enthusiasm for diverse cuisine. His original Madison venture, L-Etoile has been named one of Gourmet Magazines “Top 50 Restaurants” in America! Here’s a behind the scenes video showing how Tory keeps fresh food on the table at both of these phenomenal venues. Besides having some national celebrity chefs, Madison also boasts some of the best hole in the wall places that are sure to satisfy even the most sophisticated palette. Take a look at the list below for some of our favorite Madison restaurants you’ll want to be sure to try if moving to Madison is in your plans! Considering Madison is home to the “Great Taste of the Midwest”, an annual beer festival that features over 150 of the Midwest’s finest craft brewers, we would be remiss not to mention the beer scene in Madison. Home to some of the most unique and delicious craft breweries in the U.S., you are always sure to find a new and distinctive beer to try. After moving to Madison you’ll want to have a taste at any one of these excellent breweries! Whether you are a theater buff, a music fan, or a sports enthusiast, Madison has something for everyone. Downtown alone is home to 3 beautiful theaters: The Overture Center, the Orpheum, and the Majestic all draw huge crowds for everything from Broadway musicals to popular musical groups. In addition to the arts, moving to Madison will give you an amazing sports scene. Also mentioned above, the University of Wisconsin is well known for having successful teams especially in men’s basketball and football. A popular option for students and families alike is to purchase season tickets to men’s sports. A Saturday in fall has downtown Madison buzzing with excitement to see the Badgers defeat whichever Big Ten team is in town. If you are looking for a more affordable family option, the Madison Mallards baseball team plays all summer long and offers fantastic entertainment for kids and adults. In the summer, many of Madison’s residents can be found relaxing on the lawns of the Capitol for Concerts on the Square. Each Wednesday evening during the summer months Madison’s Capitol Square becomes a concert venue for the Wisconsin Chamber Orchestra. The best part about this event, it’s all free! Besides all of these, Madison is also home to the World’s Largest Brat Fest, the Naked Bike Ride (consider yourself warned), Art Fair on the Square, and one of most well known farmer’s markets-Dane County Farmers Market in the United States. Still not sure if moving to Madison is for you? Oh, there’s more. Families love moving to Madison and it’s no surprise based on the number of family friendly activities there are to enjoy! Animal lovers unite at Madison’s free zoo, Henry Vilas Zoo! Run entirely on donations from the Madison community, Henry Vilas Zoo houses animals ranging from goats (who you can feed!) to lions and tigers and bears, oh my! Spend the day walking through the zoo and end the afternoon with a picnic in Vilas park just outside the gates of the zoo. If animals aren’t your thing, check out the Madison Children’s Museum. Children can play in the art room, creating unique crafts from the supplies the museum provides, they can churn butter in the authentic 1800’s log cabin, or even try running around in the life sized hamster wheel! The exhibits at the Children’s Museum are all interactive and allow children to explore the world around them worry free! One of the most popular attractions for those moving to Madison, for young and mature alike is Olbrich Botanical Gardens. Explore the plants of the world at this expansive indoor and outdoor garden. Take a stroll through the tropics in Olbrich’s greenhouse, the Bolz Conservatory, then walk outside to smell the roses in the beautiful and fragrant Rose Garden. For the frequent visitor, consider investing in an annual pass. It is more cost effective than a daily pass and can be used for admittance into several other botanical gardens nationwide! For the nature enthusiast moving to Madison, be sure to check out the Aldo Leopold Nature Center. Situated in the heart of the city, this beautiful nature area is a hidden gem of Madison. Send kids to summer camp, take a hike on one of the many trails through the prairie, or explore the indoor exhibits about weather, our solar system, and even renewable energy. Check out the calendar of events for special programs offered throughout the year including a Halloween party complete with cider making, a costume parade, and a dance party! I’m telling you, moving to Madison is where it’s at! Still not sure if moving to Madison is for your family, take a look at these other great options if you are in need of even more fun activities for your active family! Eugester’s Farm Market – Great for apple picking in the fall! Take a look at some of the popular bike trails and loops that folks moving to Madison enjoy on a daily basis (yes, even in the freezing winter months!). Capital City State Trail: Over 17 miles of paved trail make up this popular Madison bike path. See Madison from the east side all the way through downtown and on to the popular south west suburb of Fitchburg. After moving to Madison you’ll want to make a day of this ride and stop at some famous downtown attractions like Frank Lloyd Wright’s Monona Terrace or enjoy lunch and a beer at one of the many delicious restaurants along the way. With it’s fairly flat terrain and paved surfaces, Capital City Trail is perfect for all types of bikers from the experienced rider all the way to the family looking to get out and explore all that Madison has to offer! UW Arboretum: If you’re moving to Madison you’ll want to take advantage of over 4 miles of paved paths in the famous UW Arboretum. Hot summer day? Stay cool in the wooded paths or take in the wildflowers of the prairie on these highly traveled trails. While it may not be the longest trail in Madison, the Arboretum trail is certainly one of the most beautiful, especially at sunset! Military Ridge State Trail: A huge trail spanning over 40 miles, this popular path runs all the way from Dodgeville to Mount Horeb. While a portion is paved, most of this bike trail is crushed limestone featuring a vast range of terrain from hills to woods to prairies. For the nature enthusiast, take a quick detour into Governor Dodge State Park where a small spur has been added to the trail. With so many beautiful trails to take advantage of, it’s no wonder the League of American Bicyclists’ gave Madison “Platinum Bicycle Friendly Community” status in 2015! If your moving to Madison make sure you bring your bike and see all that Madison has to offer! –Elver – Located on Madison’s southwest side, Elver Park is known for its epic sledding hill. If you’re moving to Madison between December and March, you are likely to see a large crowd of children all the way up to adults enjoying Elver park’s sledding hill! Besides being great for winter sports, the Elver hill, as it is lovingly known to Madison residents, is also a great resource for many different types of training exercises. Many summer mornings, the hill is full of experienced and novice runners heading up and down getting their workout in for the day! Elver also has many other great features including an ice skating rink and cross country skiing trails for the winter months and basketball courts, a disc golf course, softball diamonds, soccer fields, tennis courts, and a splash pad to fill the summer months. As Madison’s largest community park, you are sure to find something fun to do at Elver Park! –Wingra – If you are moving to Madison and are a water lover, Wingra Park is for you! Located downtown Madison, right on Lake Wingra, Wingra Park offers canoe, paddle boat, and kayak rentals. Also a popular spot to go fishing, this park is sure to entertain the young and mature alike! In addition to water sports, Wingra Park is also a popular spot for youth soccer. So after moving to Madison, grab the family, pack some sunscreen and head to Wingra Park for a day on the lake! –Tenney – While Elver Park is a great place to go sledding, Tenney Park on Madison’s near east side is one of the most popular places to go ice skating during the winter months. Complete with a warming house and ice skate rentals, anyone can enjoy the cold Wisconsin winter from the beautiful frozen pond at Tenney Park. While Tenney Park is picturesque during the winter months, it is also a wonderful place to play in the summer as well. Home to the Tenney Locks, you and your family can watch boats as they cross from Lake Mendota into the Yahara River on their way to Lake Monona, an impressive sight! Tenney park is another of Madison’s sprawling parks with many features sure to entertain the whole family that’s moving to Madison! Besides these wonderful parks, Madison is home to many other public parks that offer everything from ice skating, to fishing, to pickleball. Take a look at this comprehensive list to find your favorite! If you decide moving to Madison is right for you you’ll experience one of the most diverse and highly educated workforces in the United States. Madison boasts a strong, stable economy that rarely experiences large dips that are so common elsewhere. Thanks largely to both powerful public and private employers, Madison is an excellent place to live and work. In fact, Parenting.com ranked Madison among the top 10 cities with the best economies for families. The article attributes low unemployment rates (under 6%) and strong job growth as two reasons families are deciding moving to Madison is right for them. WalletHub ranks Madison as the 46th best city in the U.S. for jobs. The University of Wisconsin, 3 major hospitals, and a rapidly growing tech industry are just a few of the many employers in Madison that have contributed to the economic stability residents have begun to expect from this beautiful city. In addition to boasting a diverse range of employment opportunities, people moving to Madison should know Madison is also one of the most highly educated cities in the United States. According to research done in 2016 by WalletHub, Madison ranks 5th in cities “where the most educated Americans are putting their degrees to work.” According to the article, cities where an emphasis was placed on hiring highly educated individuals, the median wage was on average $4-$5 an hour higher than in places where the workforce was less educated. This higher wage is a large contributor to a strong economy. In 2015, the median household income in Madison was just over $64,000 as compared with the United States median household income which was just under $56,000. It would seem that the amount of educated employees in the Madison workforce is a large contributor to its economic strength. Whatever the cause, Madison’s strong economy makes it one of the best places to live in the U.S.! Still not sure if moving to Madison is the ticket? Check out reason 9 on why you should! Based on the wide variety of outdoor activities, bike trails, and public parks available to Madison residents, it shouldn’t be a surprise that Livability.com ranked Madison the 3rd healthiest city in America in 2015. If you are moving to Madison, take advantage of this healthy lifestyle by visiting one the eight area farmers markets for healthy foods like pesticide free fruits and vegetables or start a garden in your own backyard! If growing your own food isn’t of interest, go out for dinner at one of the amazing area restaurants that source all of their food locally! Livability’s article cites not only the amazing activities and healthy food options as reason for Madison’s high ranking but also it’s “low percentage of uninsured residents, it’s high ratio of doctors…and it’s highly active citizens”. Not only are Madison’s residents making healthy choices in regards to food and exercise, they also seem to get sick less with “most residents experiencing just three ‘poor health days,’ according to County Health Rankings”. Pretty amazing! Of course, the ease of access to health care facilities in Madison sure doesn’t hurt these numbers. See a doctor at one of the 3 major hospitals downtown or visit one of the many clinics available through the local healthcare providers like Dean, UW Health, or Group Health Cooperative. Thinking of starting your own business? If your moving to Madison the business opportunities here abound! Ranked #40 on Livability’s 2016 best cities for entrepreneurs, Madison is an excellent place to start your own business. With incubators, conferences, and resources galore, Madison offers entrepreneurs opportunities found few other places. Take advantage of Capital Entrepreneurs’ expertise, for example. Founded in 2009, Capital Entrepreneurs has helped shape the job market in Madison by contributing both funding and advice to many local startups. According to their website, their goal is to, “connect the Madison entrepreneurial community through…networking and social events.” Join them at one of their educational or social events like Startup Weekend which takes place each spring and gives local entrepreneurs the opportunity to connect with and learn from others who share a similar passion for startup business. If Capital Entrepreneurs isn’t for you, take a look at Merlin Mentors, the Wisconsin Technology Council, or Starting Block. Moving to Madison and need help getting your business started in Madison? Visit the American Family Dream Bank to get advice, share ideas, and explore your dreams with local experts who may be a little farther down the path to creating their own business. Once you are an established entrepreneur, help others achieve their goals by sharing your experience at one of the Dream Banks seminars! The Dream Bank is a space that almost makes moving to Madison worth it in and of itself. I personally love the venue and frequently take in some very valuable information that helps me take my business to higher levels.